Relyence Reliability Prediction extends prediction analysis with full system modeling capabilities. Relyence Reliability Prediction builds on the core capabilities that support reliability prediction analysis with a comprehensive feature set that take your analyses to the next level – a full package for system modeling. With Relyence Reliability Prediction, you can extend your failure rate analyses with mission profile assessments, include dormancy factors, depict your system in a graphical format, and set the stage for complex modeling using Relyence RBD. The Relyence Analysis Tree is used to create a hierarchical breakdown of your system for complete analysis. Using Relyence Reliability Prediction’s intuitive interface, you create a hierarchical depiction of your system or product using the Relyence Analysis Tree. This tree can be as high-level or as detailed as you would like. You can begin your MTBF reliability prediction analysis one unit at a time and build up your tree as your design matures. For new or next generation products or systems, you can quickly and easily reconfigure your tree, or construct new trees based on original designs. Additionally, you can view your tree in the commonly used hierarchical manner, or as a visual block diagram. Relyence Reliability Prediction supports mission profile assessment. Using the Mission Profile Editor, describe that various phases of your mission, including the overall time in the phases, and the environment and temperatures of each phase. You can also choose to include dormant phases in your mission profiles if they are applicable. 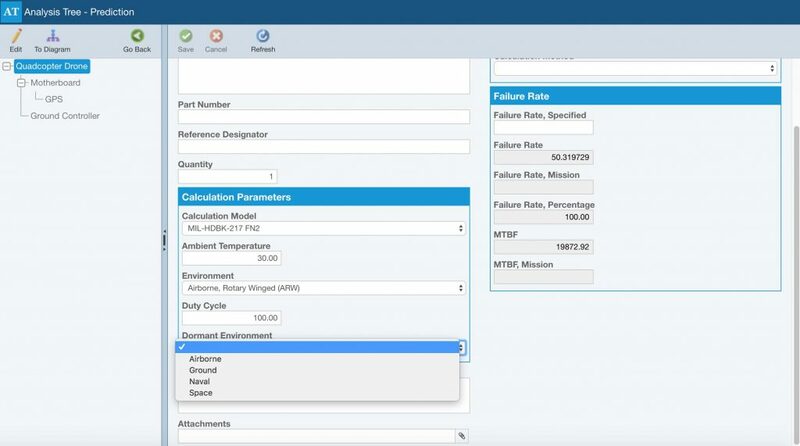 Once defined, mission profile calculations are performed using the Relyence Reliability Prediction calculation engine and results are available for reports or for inclusion in the Relyence Reliability Prediction Dashboard. 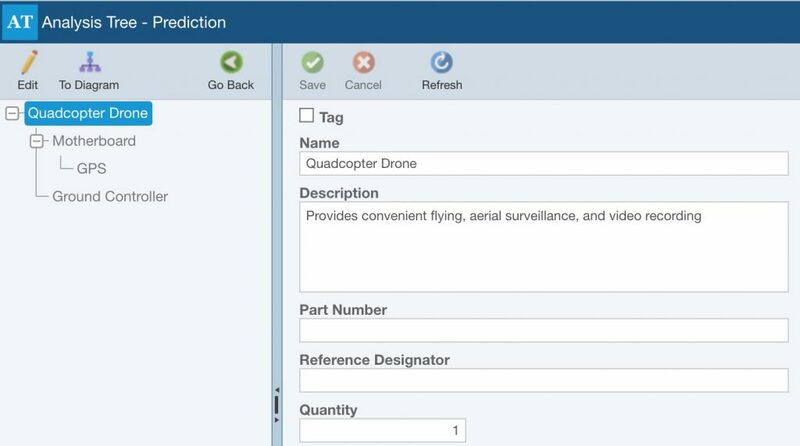 Relyence Reliability Prediction supports full mission profile analysis. Relyence Reliability Prediction can handle prediction analyses that include dormant cycles. In some cases, you may want to account for dormant factors in your reliability prediction analyses. Relyence Reliability Prediction can factor in dormancy directly by specifying the dormant state in your Analysis Tree. Dormancy can also be accounted for in your mission profile analyses by defining the dormant phases and operation conditions as applicable. Relyence Reliability Prediction includes a diagramming tool to allow you to depict your product or system in a visually descriptive graphical format. 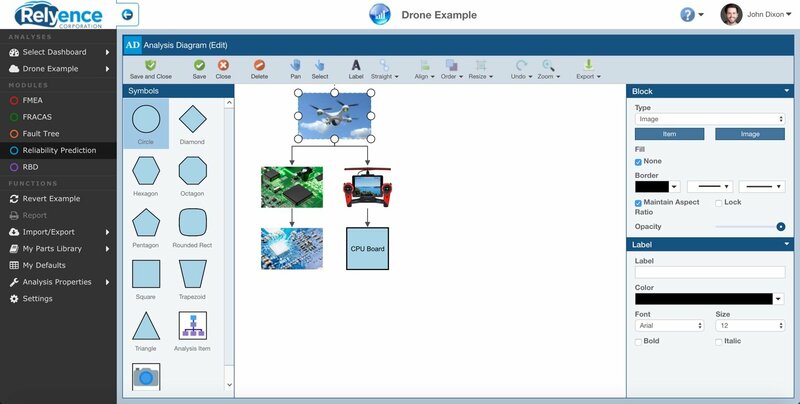 The fully featured Analysis Diagram capability can be used in conjunction with the hierarchical tree representation of your system, or can be used stand-alone. Either way, using a drag-and-drop interface and customizing your diagram with an array of visual properties, including color, font, size, borders, etc., you can create an effective model of your system. 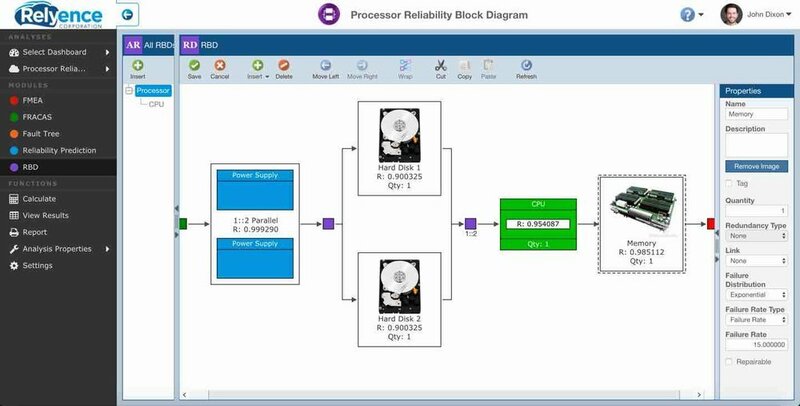 Relyence Reliability Prediction includes a built-in diagrammer for creating a visual representation of your system. Relyence RBD can be used in combination with Relyence Reliability Prediction for a power-packed duo. Relyence RBD is a powerful module which enables you to model complex systems, including those that incorporate redundancy. When used together, Relyence RBD and Reliability Reliability Prediction provide a power combination pack for comprehensive system modeling. Components in Relyence RBD can be linked directly to your system components in Relyence Reliability Prediction, allowing your calculated failure rates to be taken into account automatically in your RBD analyses. As you modify and update your prediction analyses, those changes flow through to your RBD analyses. And with Relyence you can work in either direction – complete your prediction analyses, then build your RBD model, or build your RBD and then link it to your prediction analysis later.